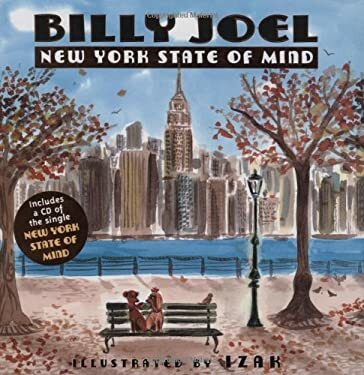 Big Apple Report: Where’s Washington [Wine]? Waldo is easier to find than Washington wine in NYC. Lettie Teague wrote a Wall Street Journal column back in 2010 called “Stalking the Wines of Washington.” In it she complained about her difficulty finding Washington wines in the New York City area. There’s just no demand, she was told, so wine shops don’t bother with Washington wines. That’s incredible, I thought as I read Lettie’s story, since so many Washington wines are both very good (served at White House dinners, we are told) and very good values, too. Hard to believe that smart New Yorkers aren’t interested in these wines! So I decided to do a little fieldwork on the question during my recent East Coast speaking tour to see if the situation has changed. OK, am I the only one who thinks visiting out-of-town wine shops is a fun way to spend the day? In this case I headed for the Morrell & Co store in Rockefeller Center and the Sherry Lehmann shop a few blocks away. Two wine shops is a very small sample size, so this study isn’t statistically significant, but these are the flagships of the region’s wine fleet, so surely they reveal something. Here’s what I found. Both stores were smaller than I expected given their fame — I guess I didn’t factor in Manhattan retail floor space costs when I imagined what they would look like. But the number of bottles isn’t as important as the quality of the selection (that’s the key to Costco’s wine selling success). My attempt to find Washington red wines in these stores was not very successful. I managed to locate a wine from Betz Family Winery at Morrell and a modestly priced red blend from Claar Cellars at Sherry Lehmann. And that was it for Washington reds. I might have missed a bottle or two (I blame my bifocals), but even if I did the selection was pretty limited. I didn’t check the white wines — maybe there were more over there. There were plenty of French and Italian wines. Sherry Lehmann’s Burgundy selection made my mouth water and my credit card cry. Lots of great wines from Bordeaux, too. But where was the Washington wine section? Nowhere. No California wine territory, either. They were all grouped together as “American wines,” suggesting that Sherry Lehmann’s customers might be more interested in the fine points of French geography than domestic wine terroir. And apparently almost completely uninterested in Washington. Why? I talked a bit with a friend who knows New York wine business pretty well and we came up with a couple of theories. Maybe it is a supply-side problem — distribution? Yes, I suppose that could be the case. Distribution inefficiencies usually affect the “middle market” the most. Iconic wines (and I’d put the Betz wine in this category) get distribution and so do larger volume wines (Chateau Ste Michelle, Columbia Crest, etc), but in-between producers (like Claar Cellars) get squeezed out. As you can see, my “small n” obversations aren’t completely consistent with a supply-side explanation, although you cannot rule it out, either. So what about demand? Maybe the demand just isn’t there as the shop owners told Lettie Teague. So why not? Well, here’s where a second set of observations is useful. While I was looking for Washington wines I also kept an eye out for Oregon Pinot Noir. And, while the Washington wines were all but invisible, I discovered a handful of interesting Oregon Pinots in each store. So now the question gets more interesting. Why is Oregon part of the New York state of wine but not Washington? Here my NYC friend (who is a Washington wine fan) offered another theory: Oregon stands for something concrete in the crowded New York market, but Washington doesn’t. When you think of Oregon wine you think of Pinot Noir because that’s its signature wine variety and demand-side market focus. But what do you think of when you think of Washington? Well, that’s the problem because Washington makes so many great wines but lacks a signature variety or style. I’ve written about this situation before and I don’t want to beat a dead horse here, but you can see how it can be a demand side problem. Every NYC customer who asks for Oregon wine is probably thinking Pinot, but if ten customers ask for Washington wine they are unlikely to request the same wines or types of wines or grape varieties. It’s easy to see how a critical customer mass for Oregon Pinot Noir might appear but not for any particular Washington wine. A final theory comes from the economics literature — you might call it the “home court advantage” theory but technically it is based on the “gravity model” that is used to analyze international trade patterns. The gravity model holds that geographical proximity is a strong predictor of trade patterns — the closer countries are to one another the stronger the force of “economic gravity” that pulls their economies together. I see the home court advantage at work here within Washington State and it is widely observed that while the wine industry is global, wine consumption has a strong local bias. If this theory applies to the New York case, then it suggest that Europe is New York’s home court and that the pull of French gravity is especially strong. Given the many different languages that fill conversations on cosmopolitan New York City streets, this doesn’t seem like a crazy theory at all. A quick analysis of the Morrell and Sherry-Lehmann websites reinforces my on-the-scene observations and adds more data since the warehouse selection is so much bigger than the Manhattan stores. 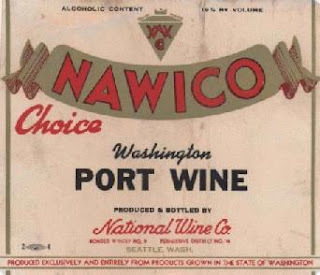 I found more Washington wines in the online stores, but I was still surprised by the relatively limited selection. And I was surprised as well that Washington and Oregon had about the same number of wines on the sales lists despite Washington’s vastly greater number of wineries and total production. Burgundy (1122 wines on the Sherry-Lehmann site) has many more wines than California (612), Oregon (31) or Washington (30). The particular wines listed on the Sherry Lehmann site suggest that the distribution theory is part of the explanation. More high volume Chateau Ste Michelle and Columbia Crest wines and some famous name icons, but a thinner middle market selection. It looks to me like all three forces are at work here, making this a particularly complex and difficult situation. Readers: use the comments section below to provide your own observations and theories. I have seen the future of wine. It’s on display right now at your local supermarket — unless of course you live in New York or one of the several other areas where misguided state law forbids the sale of wine and food in the same establishment. Your day will come for supermarket wine, my friends, but not quite yet. I don’t mean to suggest that supermarket wine is the only direction that wine is heading, but it is a very powerful force. As the world of wine broadens and American wine drinking culture becomes more firmly established in the socio-economic mainstream, wine sales seem likely to become even more concentrated in the vectors where everyday consumer purchases are made. Supermarkets aren’t the only important wine selling space, but they are one of the most dynamic. It just makes sense. The U.S. did not achieve its current status as the world’s #1 wine market (ranked by total not per capita sales) because more people are spending time at specialist wine shops or liquor stores, although I am sure that is happening (note the success of businesses like BevMo and Total Wine). The increased availability of wine at supermarkets, Costco and Sam’s Club and now also drug store chains (all included in my broad definition of “supermarket wine”) is driving the market. A recent article on Shanken News Daily notes that Yellow Tail wines have been able to keep their U.S. sales high despite wine market problems generally and Australian wine problems in particular by increasing drug store sales to offset declining purchases in other retail segments. Drug stores? 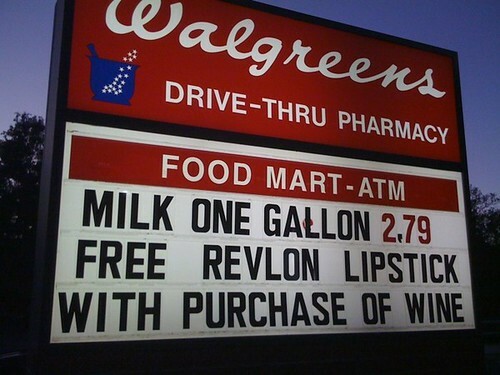 Wine next to lipstick, baby wipes and band-aids? Walgreens wine? Yes! Walgreens has even launched a house brand called Colby Red, a California red blend supplied by Treasury Wine Estates. The British led the way in supermarket wine and for good or bad the world has followed their path. Wine is attractive to grocery store owners because of its relatively high retail margins and its ability to sell other goods at the same time. The British pioneered house brand supermarket wines and that trend is continuing, too. Here is the U.S., most major retailers have their own wine brands (generally made for them by large scale producers such as The Wine Group) – even Walmart and 7-Eleven. In Britain, the venerable Oddbins chain has closed its last store, a victim in part of pressure from Tesco and other supermarket chains. (Tesco is now the world’s largest retailer of wine.) Supermarket sales are seen as the key to rising consumption in China, too, although they are not the only growth area in this rapidly maturing market. Torres is expanding its Everwines store chain, for example, an indication that specialty shop sales are rising as well. Supermarket wine is one of those “is the glass half full or half empty” issues. It is hard not to appreciate how much supermarkets have done to promote wine (where they are allowed to do so), especially compared with the dismal selection and service of just a few years ago, but it is also easy to dismiss them as being part of a trend towards simplified wine from corporate makers. I think both trends exist: supermarket wine is a business and so for the most part it follows established business practices. But wine consumers are complicated people who appreciate diverse offerings, so consumer interests are strong, too. I wanted to take the measure of a “typical” supermarket wine department and I was fortunate to get some help. Our local business district partnered with my university a few weeks ago to organize a “Spring Zing” festival designed to get students and their visiting families to connect with local retailers. Our neighborhood Safeway hosted a book signing by my favorite cookbook author Cynthia Nims and invited me to give a talk in their wine aisle. This was my first supermarket gig (but I hope not my last), so I felt a little like Roger Miller’s “King of Kansas City” – a #1 supermarket attraction (see video at the end of this post). About a dozen students, parents and random curious Safeway shoppers met me for the talk. I briefed them about supermarket wine then turned them loose to do some fieldwork. I had questions for them to answer — a treasure hunt! How big is the wine section (how many different wines are sold)? How many different countries are represented? How many different U.S. states? And what are the cheapest and most expensive wines on sale? How, in short, does supermarket wine measure up? They found the answers pretty quickly. Total number of wines? About 750 according to two economics majors (economists are good with numbers!). Is that a big number? No — and yes. No in the sense that it is a small number of SKUs compared with the tens of thousands of wines that are available. This is a tiny slice of the pie in that regard. But it is a big number compared with, say, Costco, which stocks fewer than 150 different wines at any one time. And of course it is a big number compared to any other part of the store. Where else in a modern supermarket can you choose from among this many different options? A lot of the wine sold here comes from a few large producer portfolios — Gallo, Constellation Brands, The Wine Group, Ste Michelle Wine Estates and so on. So in one sense the diversity is less than it might initially appear and that’s why some enthusiasts, who want to see more small producer labels, are disappointed in supermarket selections. But there are also many wines from high quality medium sized wineries (Hedges, for example, and Frog’s Leap at this store) so it would be wrong to say that supermarket wine is only limited to big players. And some of the big dogs offer real diversity, too — the wines don’t all come out of one big vat in Lodi! Where in the world does the wine come from? This Safeway store had a strong regional bias in favor of Washington and California wines with smaller selections from other areas. The usual suspects showed up. Twelve foreign countries (Australia, New Zealand, France, Germany, Italy, Spain, Portugal, Chile, Argentina, South Africa, Greece and Japan — if you count plum wine) — and four U.S. states: Washington, Oregon, California and New Mexico (Gruet sparkling wine). It didn’t take very long for my crew to sniff out the highest and lowest priced wines and the difference was amazing. Initially they focused on Quail Oak, Safeway’s house brand wine (made by The Wine Group, I believe) that was in Two Buck Chuck range at $2.99. But then they got out their calculators and discovered that they could purchase 5-liter bag-in-boxed Franzia wine for even less — about $2 per bottle equivalent. That’s the low tide price point at this Safeway. The high price? A bottle of vintage Champagne was priced at more than $300 (but only about $220 with your Safeway Club Card discount). It is even cheaper if you buy a six-pack and take the extra 10 percent discount. Very expensive for supermarket wine! But it makes the bottle of Dom Perignon sitting next to it in the display case seem relatively affordable. The most expensive wine is 100 times the price of the cheapest one! What a tremendous range of price points! I think it is probably impossible to find an equivalent gap between low and high price for products in the same overall category anywhere else in the store. The supermarket wine phenomenon is very interesting to me because it provides clues as to how the American wine scene is changing. While it is obviously wrong to draw general conclusions from a single specific case, I do think this one store is very interesting in terms of the questions that it raises about price, selection … and the future of wine. Reading over this post it occurs to me that a valid criticism would be that I am not demanding enough of supermarket wine. I seem to accept supermarkets for what they are and not press them to offer even more choice and diversity. I think this is half true — I do accept that supermarkets are subject to economic constraints that define their business model. I acknowledge that, as key wine sales vectors, they have power to shape the wine culture if they want to. I am optimistic that they will do so in response to changing consumer preferences. The typical Safeway wine department profiled here is enormously different from what I would have found ten or fifteen years ago. Who knows what I will find ten years hence? Thanks to Safeway for inviting me to talk about wine in their store. Thanks to everyone who showed up and participated in my wine treasure hunt game. As a known “Wagnerian” sympathizer, I am naturally in favor of the “democratization” of wine. Power to the People is good, Wine to the People is even better (and sometimes equally difficult to manage). Recently I’ve run into a couple of stories that suggest that good wine may be trickling down to the masses in interesting ways. The 187 ml serving of French Shiraz (really? ), Chardonnay or Rose wine sells for £2.25 at Marks & Spencer stores. This is wine that you can take anywhere and consume as you please, even if you only want a single glass. It is sort of a wine juice box in functional terms, if you know what I mean, but classier, with a stemmed plastic glass in place of the cardboard box and sippy-straw. I have seen Le Froglet here in the U.S. selling in the $3.50-$4 range. Le Froglet is noteworthy for several reasons, First, it seems to be very popular in Britain, where it has created a new market category. That doesn’t happen very often. It has succeeded despite highly publicized expert opinion that the idea of takeaway “cuppa wine” is totally lame. James Nash, the inventor of the packaging and process, appeared on the popular BBC television show Dragons’ Den where supersmart investors took his product and business plan apart brick by brick, leaving him standing in a pile of rubble. Fuggetaboutit, they told him in no uncertain terms. Interestingly, the people at retailer Marks & Spencer saw the same idea and came to a different conclusion. They viewed the single-serving glass as a perfect place to put their line of Le Froglet French wines. I suppose with a name like Le Froglet they weren’t taking themselves too seriously. Why not wine by the glass to go? Why not indeed? And so they gave it a try. They seem to be pleased with the results. An M&S spokesman said: ‘The glasses are merchandised in our ‘Food on the Move’ section, which is obviously the aisle people on the go head to – particularly office workers. ‘We think that they are proving popular with people who want to perhaps enjoy the summer with a glass of wine in the park as part of an impromptu picnic – either after work or for a relaxing lunch. I think one key to Le Froglet’s success is that it exceeds everyone’s expectations (except perhaps the grumpy Dragons’ Den gurus). You don’t really expect the packaging to work, for example. You expect the seal to leak or the plastic glass to break. But apparently it works pretty well. Surprise! One element of the democratization of wine is making it more convenient and Le Froglet certainly does that. Of course this convenience comes at a price. One £5.49 bottle of Le Froglet holds four £2.25 single-serving glasses, making the bottled product the better buy. But that glass-bottle price ratio is about what you find in most restaurants, where the rule of thumb is that the retail price of a glass of wine is equal to the wholesale cost of the whole bottle. Good, cheap and convenient seem to form a trilemma with wine — difficult to get all three at once. Cheers to Le Froglet for making decent wine more convenient, even if it isn’t really cheap. What could be more democratic than fast food wine? Sounds perfect, but it is hard to imagine a fast food restaurant that could find a way to serve wine here in the U.S. with our Byzantine regulatory system. So you can appreciate my pleasant surprise when I was able to order wine with my dine-in meal at the Burgerville fast food outlet near Vancouver, Washington. Burgerville is a popular Oregon-based fast food chain that specializes in fresh, local and sustainable products. Burgerville is designed to exceed your expectations about what a fast food meal can be and if you pay a bit more for the food you probably get more, too. The restaurants have always been very busy when I have visited, so people must think they are a good value. I certainly do. Here is the sales receipt from our meal at the Salmon Creek Burgerville (the only store in the chain to offer wine by the glass so far). I passed on the upscale burger / fries / shake part of the menu this time to take advantage of seasonal offerings: a mound of Walla Walla Sweet Onion Rings (yum!) and two Full Sail Amber Ale Battered Albacore fillets with a side of Oregon cranberry-studded summer slaw. My beverage of choice, a $5.95 glass of flavorful and refreshing A to Z Wine Works Oregon Pinot Gris. Heaven! Fast food taken to a new level. Burgerville offers three red wines and three white wines by the glass at this location priced at $5.95 and $6.95. I think I’ll have a glass of the Syrah with a bacon cheeseburger on my next visit! The wines sell pretty well, I was told, which is of course what I hoped to hear. The Salmon Creek store is testing the concept of what you might call premium fast food wine. This store was apparently chosen because it has a large and well organized dine-in area that made it possible to meet regulatory requirements. (Don’t look for wine at the drive through window just yet, although with Le Froglet I suppose it isn’t completely out of the question!). The democratization of wine? We’re not there yet — wine is still more difficult to buy, sell and consume than it needs to be — but Le Froglet and Burgerville show what we are headed in the right direction. Wagnerians, rejoice!